GAP Broadcasting really knows how to tell its listeners how to have a good time. It doesn't hurt that they've got support from Beaches and Sandals resorts. Over the past year, GAP's listeners throughout the Southwestern US and the Northern Plains to the Pacific Northwest have been living vicariously through station personalities and some lucky winners who get to play on the beaches of the Caribbean. 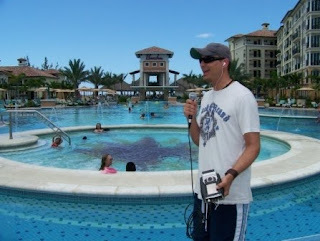 The all-inclusive resorts offer "luxury" included and some great radio as the entire experience is sent back to the folks at home. 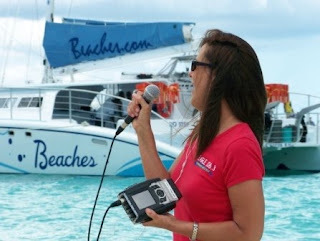 Jeff Easterling, known to his fans on Texarkana's Eagle 106.3 as "The Jeff", sent in some photos from a recent GAP remote at the new Beaches resort in the Turks & Caicos. Says Jeff, "We have used the Comrex Access with some of our GAP Broadcasting multi-market remotes from the Sandals and Beaches Resorts in the Caribbean. They are so easy to use, and the audio quality is outstanding. With us broadcasting multiple stations, to multiple markets back in the states, the Access is perfect for us. We are able to easily program them to each station in just seconds, which is great so we can get back to work quickly…on the beach." Lisa Lindsey Brad Weiser are in the pics. Lisa is broadcasting to Texas, and Brad is broadcasting to Idaho. A GAPster interviews a Beaches employee. © 2007-2010 Comrex Corporation. Picture Window theme. Powered by Blogger.